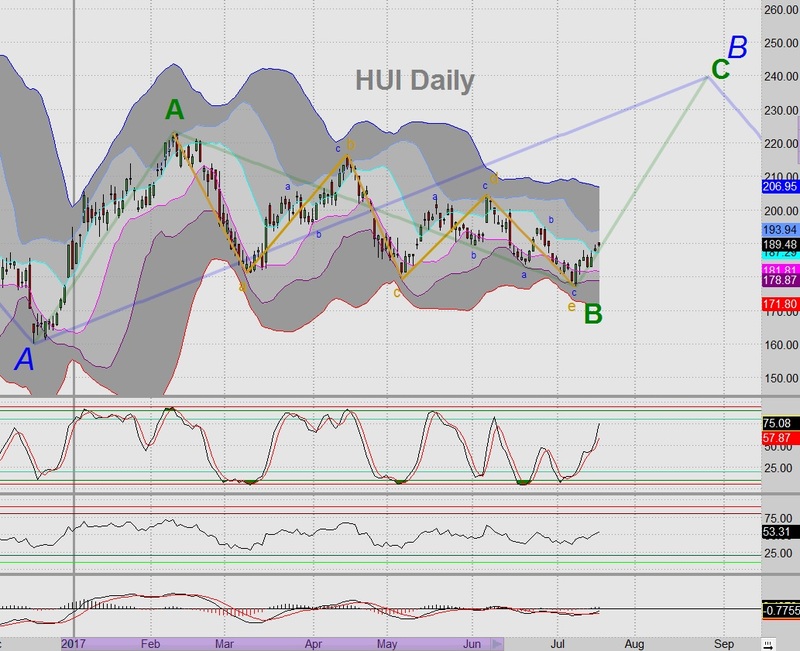 This is HUI Daily chart showing my primary Elliott Wave interpretation. 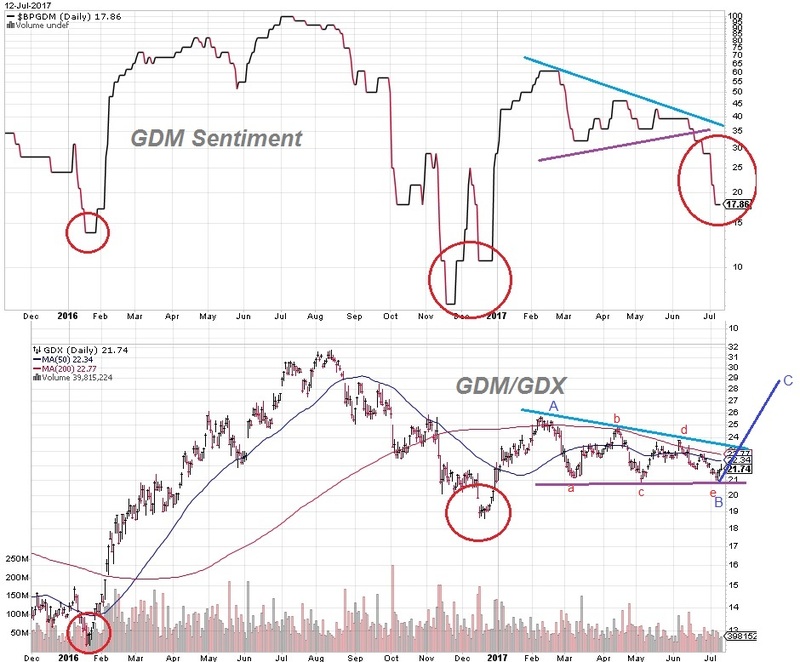 This is an extension to the GDX analysis I provided last week (see below: July 12, 2017.) I believe we have completed the recent consolidation (from the February, 2017 high at green "A" through July, 2017 low at green "B".) This actually played out as a very well-behaved a-b-c-d-e triangle. As with most a-b-c-d-e's the move off of the end of "e" tends to be a rather sharp move and that is precisely what we are seeing. The reason behind this phenomenon is that the "consolidation" was rather demanding and stressful for many traders who normally prefer longer trending markets. Because there were so many short-lived rallies (and sell-off's) many traders got frustrated and have stepped away from trading gold stocks for awhile. But now that the "e" wave has ended, those that recognize such things are jumping in as aggressive buyers before the regular trading crowd figures out what is happening. The target (green) "C" wave should play out as an impulsive move up to the 240 area with a likely timeframe around the last week of August. This forecast was estimated using the price and time length from the (green) "A" wave and mapping it to where "B" ended. It is a very common pattern for "C" waves to equal its corresponding "A" wave. There is no guarantee, of course, but it happens often enough that it provides for an excellent starting forecast. The next larger Elliott Wave structure is not completely visible, but the (blue) series as an A-B-C started at the high on August 2, 2016 at 286 and ended at (blue) "A" on December 15, 2016 at 160. The entire (green) series shown above comprises the extent of (blue) "B" wave. So the (blue) "B" and (green) "C" are targeted to end at exactly the same price and time. Once that ends, then (blue) "C" (not shown in chart) is likely to play out as a rather substantial sell-off that drags HUI down to the area below 120, probably sometime in January, 2018. We will re-address this larger forecast once we are certain that (blue) "B" has ended and "C" has begun. To zoom out in our Elliott Wave view even one more step, there is a much larger A-B-C that is also in play. This one started in January, 2016 at the incredible low at 99. From there the "A" wave rallied up to 286, ending in August, 2016 (this is where the blue series, above, started.) The "B" of this series will end when the (blue) "C" also ends (tentatively January, 2018 below 120.) From there we should see a massive rally that should mirror the big 2016 rally. The "A" wave rallied form 99 to 286, so this large "C" wave should match that performance rallying to well over 300. Negation: This scenario is only valid if HUI stays above the low at (green) "B", which was 177.40 on July 10, 2017. If for whatever reason, HUI falls below 177.40 within the next week or two, then the outlook I described above is probably incorrect. There are other secondary Elliott scenarios, but they have a much lower probability. The only one worth mentioning right now might be an alternate for how (green) "B" ends. Looking at the (gold) "d" to "e" wave we see a 3-wave a-b-c labeled in (blue). The alternate scenario could play out by extending that into a (blue) a-b-c-d-e such that (gold) "e" moves out and down to perhaps 172 near the end of July, 2017. In order for that to happen, the turn down from the most recent price (190.24 on 7/18/2017) must occur immediately or the 5-wave zigzag pattern will not fit properly. Also, it is very unusual (not impossible, just unlikely) that the "e" wave of an a-b-c-d-e pattern would, itself, end with a lower-level a-b-c-d-e pattern. 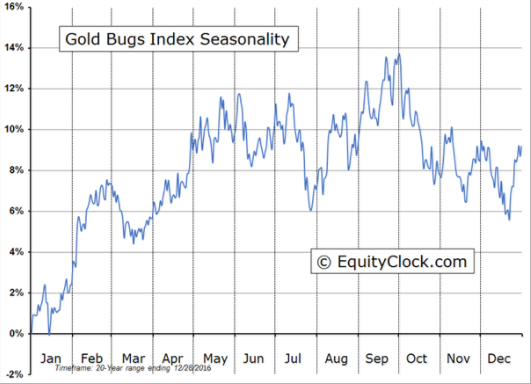 The Gold Bugs Index Seasonality chart does show the possibility of a summer seasonal low closer to the end of July, so that is something worth monitoring. As traders in gold stocks we don't get very many truly massive rallies that tend to only occur about once per generation. So for some of us older folks, we only get maybe 2 or 3 opportunities to really score big time in gold stocks. The 2016 rally was one of those memorable rallies. As it turns out, the up-coming 2018 rally should be one of those rare opportunities to play multiple rallies of this magnitude in such as short period of time. As for HUI, the 2016 rally nearly tripled, so the 2018 rally should be close to matching that performance. This means there will likely be many individual gold stocks that will be so severely beaten down by January, 2018, that once they recover and join in the rally, they could return multiples much higher than 3x. If you want to see what I mean, go back and review many of the gold stocks in January, 2016 and see how they performed -- some of those stocks returned 5x, 10x, and a few even more. For as bullish as I may appear to be for gold stocks right at the moment, please keep in mind that this current rally is only expected to last another 5-6 weeks. That places the anticipated top smack dab in the timeframe when US equity stocks could be exhibiting enough weakness as to begin a very significant correction. It is also the timeframe when Congress/Senate will be actively debating debt limits and tax reform. I try to not be a big conspiracy nut, but I really do think there are enough people out to do harm to Trump that stalling on the debt ceiling or scuttling any progress on tax reform, is just the kind of thing that could trigger a very significant stock sell-off. Gold stocks are stocks, just like all the rest. If US stocks do indeed have an autumn sell-off, then it is very likely that gold stocks will get caught up I all of the panic and confusion. This is not to say that gold as a "safe haven" won't be of interest, but because of the massive amount of margin leverage that is currently being used for US stocks, when the sell-off begins in earnest and brokers start making those nasty margin calls to underwater investors, they will be forced into selling anything and everything in order to satisfy those calls. The normal first wave of margin calls drags in the most liquid assets, particular those that are showing good gains. As the sell-off progresses deeper, traders will reach for progressively less liquid and less profitable assets to make the next wave of margin calls. Eventually, all assets are vulnerable, including, but not limited to: crude oil futures, gold & silver, Euro's, Bitcoin, corn, pork bellies, & cocoa, and even real estate. It is not my intent to scare you, it's just that even in a severe stock sell-off when you might otherwise think those assets should satisfy as a role as safe haven, when massively leveraged margin traders are caught deep underwater, they will sell anything and everything they can get their hands on.